Jawadis new MightyBreeze ventilated full bee suit for pest control and beekeeping are top of the line and come with sizes up to 10XL. 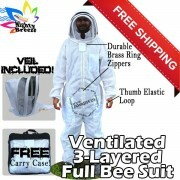 This fully head-to-ankle vented beekeepers suit offers protection from stings. The ventilated fence veil is completely detachable or may be thrown back when not in use. This Jawadis MightyBreeze bee suit has five good sized pockets, genuine brass metal ring zippers for easily zipping up or unzipping even when your gloves worn.